Stock prices for public companies in the smart home, consumer electronics, IoT and custom integration markets drop 19% on average in 2018. Sonos, ADT IPOs skid downward. 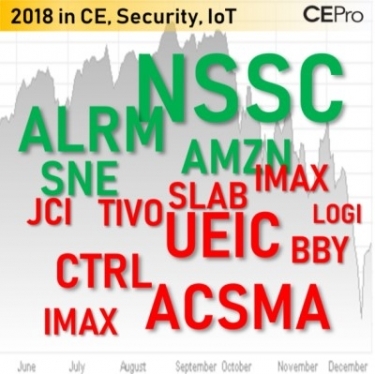 Napco (NSSC) and Alarm.com (ALRM) had a banner 2018 on the stock market, but Control4 (CTRL), Universal Electronics Inc (UEIC) and almost all other CE, IoT, Smart Home and consumer-electronics stocks tanked. Oh what a difference one year makes. Stock prices for public companies involved either fully or via a subsidiary in the professional installation market for smart home products fell an average of 19.36 percent in 2018. That is compared to an average 40 percent gain in 2017 (and an increase of 22 percent in 2016). Overall, the Dow Jones Industrial Average rose 1.1 percent in 2018, so custom integration stocks clearly did not perform as well as the general market, which was characterized by tremendous up and down swings the final month of the year. The list of publicly held companies tracked by CE Pro includes 52 companies this year. As always, the list changes every year as companies buy into the smart home space, or sell their smart home assets. There are always a number of IPOs focused on the market too, including ADT, Resideo, Arlo and Summit Wireless (WiSA) in 2018. Other companies still on the list may not be tracked after 2018, including stocks like Lowe’s, which recently announced its plans to exit the smart home space as soon as it can sell off its Iris home automation platform. As always, many of the stock prices (rise or fall) are not reflective specifically of the state of the smart home market. Most of the companies on the list are highly diversified companies engaged in multiple industries, from automotive to elevators. The market was not good for IPOs in 2018. Across the board, every IPO had a stock price fall. In 2018, just eight of the 52 stocks showed price gains. Napco Security Systems was the company with the highest stock price jump last year, leaping an incredible 82 percent. The Amityville, N.Y-based company's stock rose from $8.65 to $15.75 over the past 12 months. Napco's iBridge home automation platform appears to be catching on with both security integrators and custom electronics dealers alike. Other solid gainers in 2010 were IAC Interactive (HomeAdvisor.com) up 42 percent, Alarm.com (up 38 percent) and Amazon (up 26 percent). Other companies in positive territory for 2018 were Microsoft (up 18 percent) and Sony (up 5 percent). Lowe’s and Intel also finished with tiny gains in 2018. That’s about it for the good news. The company with the biggest stock price decrease last year was Ascent Capital, owners of MONI central station services, the largest in the security industry, and the owners of the Brink’s Home Security name. The company saw its stock price fall 97 percent to a scant 39 cents per share. Just two years ago, the stock was sitting at a healthy $16.61 percent share. In 2017, Ascent stock fell 29 percent. The market was not good for IPOs in 2018. Across the board, every IPO had a stock price fall. ADT, the No. 1 company in the CE Pro 100, fell 57 percent after its launch in January 2018. Arlo Technologies spun off from Netgear in July and subsequently fell 38 percent from its opening price. The most anticipated IPO of the year was Sonos but not even its strong consumer following could tilt the market in its favor. The stock fell 35 percent to $9.82 per share following its launch in July. Lastly, Honeywell spinoff Resideo (ADI distribution, Honeywell equipment) also did not fare well. The stock price dropped 37 percent overall after its IPO in October. Bellwether stocks in the market had a tough year. Control4 saw its stock fall 41 percent in 2018. The company was coming off a year that saw its stock price nearly double in 2017, but the stock fell back to earth to end the year at $17.60 per share, down from its $29.87 price in January 2018. Best Buy also fell with the market swoon at the end of the year. The company ended 2018 at $52.96 per share, down 23 percent. That is compared to a 61 percent spike in 2017. The 2018 price fall was despite strong quarterly sales numbers from the giant retailer. Not surprising, the most expensive stocks are Amazon at $1,501 per share and Alphabet at $1044 per share. The cheapest stocks on the list are Ascent, Office Depot ($2.58) Summit Wireless (WiSA) ($3.42), and VOXX ($3.96). Here is a list of 52 public company stocks tracked by CE Pro and how they fared in 2018.